At 7:55am 68 years ago today, Pearl Harbor was attacked. 187 Japanese planes began dropping bombs on the ships in the harbor as well as planes in nearby airfields. A second attack came an hour later with another 163 planes continuing the assault. When the attack was complete, of the 96 ships anchored, 21 had been sunk with many others severally damaged. Out of 394 planes at airfields Hickam, Wheeler, and Bellows, 188 were destroyed and 159 were damaged. There were 2,403 (including 68 civilians) killed and 1,178 were wounded. 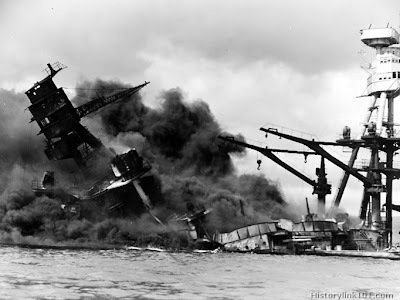 The USS Arizona was struck by a torpedo, within 9 minutes the ship sunk killing 1,177aboard. The USS Oklahoma after being hit rolled over on its side, pinning men inside and underwater. Of the crew of 1,301, 429 died. The USS West Virginia sank after being struck numerous times by both torpedoes and bombs. The USS Nevada was also hit by both torpedoes and bombs. After the first attack, the Nevada headed out to sea through the narrow channel of the harbor. The Nevada almost made it when came the second attack. The planes tried to sink the Nevada with hopes of blocking the channel, but the crew chose to beach the ship instead. There were two other smaller ships, the Shaw and the Oglala, both were badly damaged. (The Oglala capsized.) The Vestal was beached. The Utah, a target ship for the U.S. military, was also sunk. In a little over two hours, 21 ships had been sunk and over 2,000 Americans had been killed. Japan’s attack had been devastating and destructive. However the aircraft carriers were not in port. What a blessing. This meant the American left fleet was almost intact. The aircraft carriers later proved to be the main ships used by the Navy. America had been divided over how much involvement and aid they should give to the Allies. However when President Franklin D. Roosevelt asked Congress to declare war on Japan the country was united. The US would make Japan pay for the attack and help to rid the world of Nazism and Fascism. order for the attack to be a success it must be a crushing blow. The attack was devastating, but it wasn't a crushing blow. Instead it gave the Americans a rallying cry that carried them through to the end of the war: "Remember Pearl Harbor." 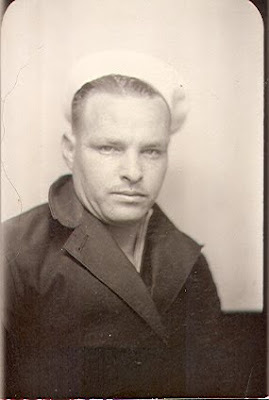 This is dedicated to the memory of my grandpa, Ruben D. "Mac" McEwen, who was in the Navy and at Pearl Harbor on December 7, 1941. May we always Remember Pearl Harbor.